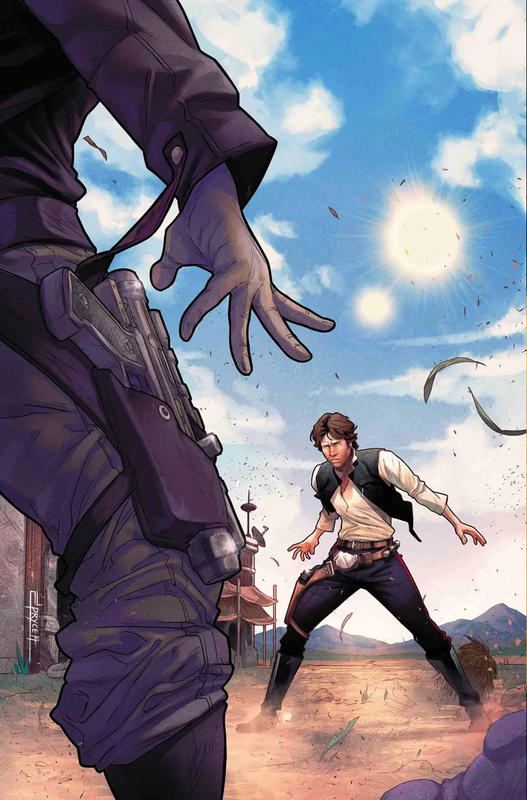 So, Star Wars #59 lays out some of the cards on the table. Just about everyone reveals what they’ve been up to behind the others’ backs, and everyone has been busy. The build up is that Luke sense his signal, and someone answers. The question is, is it friend or foe? Spoilers follow. One thing I liked about this issue is that is was about finding the measure of people. Luke reveals himself to be rash, narrow minded and reckless. He can’t stand being on a planet and out of the fight. He’s willing to risk everyone’s lives in order to get back into the fight. So he uses his homemade beacon. But things get confusing from there. It’s revealed that Thane was blocking the signal. However, someone does show up on the planet. Did Thane contact them? On the other hand, the people who show up say they go their intel of Sana Starros. So if that’s the case, what did Thane do? It’s not really clear yet. Regardless, the people who show up are Scar Squadron. Rather than having a fire fight with the Rebels then and there, Thane has most of the Rebels stunned and allows Luke and Kreel to duel in personal combat. That’s where the comic ends at. It raises questions and it gets to a climax. Will have to see where things go in the next issue. Will Scar Squadron get some minor victory or will they be killed off for good? And what the heck is Thane and his group up to? The art is pretty good for this issue. There’s some good likenesses, lots of detail, some fun action, and good character shots. Han gets some of the best scenes, and it makes it worthwhile. Overall, pretty good issue. It’s a fun little side adventure. I give it a four out of five metal bikinis.